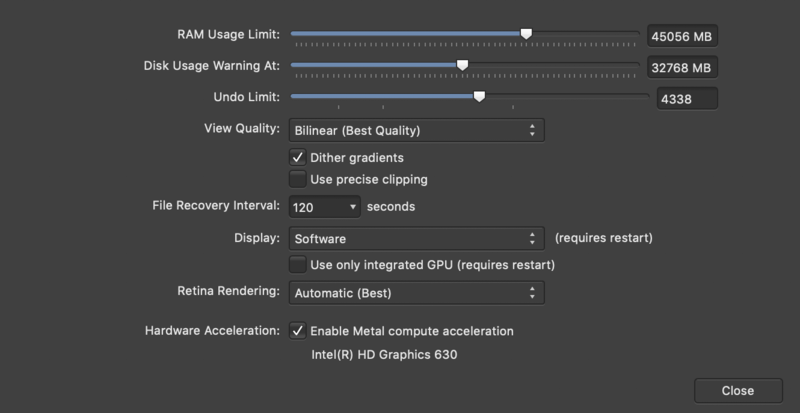 I'm experiencing a poor graphics performance after upgrading to Mojave, tried switching from OpenGL to Metal, which didn't do a trick and then switched back. 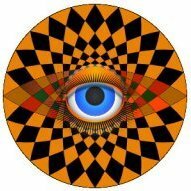 Are anyone experiencing similar sluggishness? And maybe somebody can tell me ways to work around it? Do you have Metal Compute enabled in the Performance section in Preferences? If so turn it off and see if things get better. There's a known issue that should be fixed in the next v1.7. 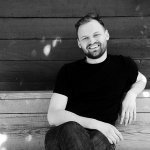 Out of curiosity, are you performing batch jobs? This is what I have at the moment, it very slow, even when I try to hide a layer I see squares slowly disappearing and no Im not doing any batch jobs, if by batch you mean postproduction on many different images at the same time. Is it happening with that particular file only or are you experiencing performance issues in general with all images? Tried to switch to all available options, performance is the same on all of them. From your video, it appears you have quite a few other apps open & a large number of extra menubar items installed. I am not familiar with all of them but each one will probably use at least some memory & CPU resources, leaving less of both for Affinity Photo to use. If any of them are not 100% compatible with Mojave or if they do not use 64 bit code, their resource use could be excessive, causing the kind of performance problems you are seeing. As it is, one of the menu items, the one with the 4 blue bars, appears to be a CPU use graph. In the video, it maxes out frequently whenever you do anything in Affinity Photo, I believe indicating all 4 cores of your CPU are running at their maximum capacity. So I suggest as a test, first quitting all the apps you do not need to run concurrently with Affinity Photo & see if that helps. You should also make sure all your add-on menubar items are up-to-date versions known to be fully compatible with Mojave. Even if they are maybe consider not running so many of them at once. This is because some of them may not be fully compatible with each other, for example competing for the same resources which can cause the OS to spend a lot of time resolving file arbitration conflicts, performing memory page swaps, & such. Personally, I try to avoid as much as possible installing menubar extras that are not provided by Apple because of the hard to diagnose problems they can cause. Thank you for your input! I quit all the apps and menubar items and it did not change a thing i performance in the same file! Then I tried to copy layers piece by piece to a new document, eventually, what turned out to be slowing things was Gaussian Blur live filter - after I rasterized it, things started to work smoothly - on and off works as before etc. So I guess live filters are not optimized for OpenGL or Metal in Mojave. When 1.7 is due by the way? Live filters can slow down things considerably but your file seems to be quite small for such slowdowns. 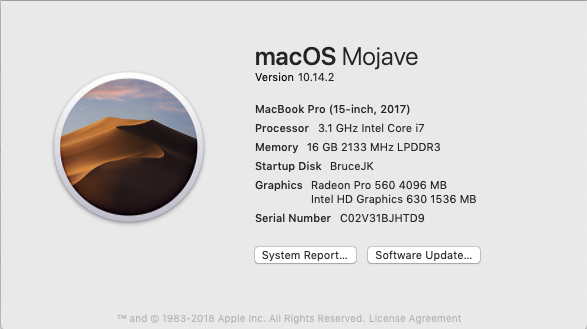 A few users have been reporting performance issues in Mojave as well so there may be something else causing this. Do you mind uploading the file shown in your clip for us to take look please? Thanks. There is a known bug for the Metal Accelerator. I have tried lots of solutions, and for me the issue is still. not solved, and although Affinity have promised a fix, so far nothing... They blame Apple for a bug in the Metal Compiler, Apple deny this is an issue and refer me back to Affinity (Serif). I have got AP working after a fashion, by using the Software option for the GPU, as Open GL (Basic) and Open GL seem to have the same slow down issue. There are also issues with Batch Processing that seem to be connected. All this on a 2017 MBP with 16Gb Ram, and 2.9 GHz i7 Processor, and using the software option makes the response unacceptable. I do not know if this is the same issue, but after more than a month, there has been no fix - simply the message that we have to await the next update from Serif. Problem was so bad as to make AP unusable, and I have had to return to Photoshop CC - which was surprisingly refreshing given the updates and the AI assisted processing. This has been an issue with 2017 MBP's. 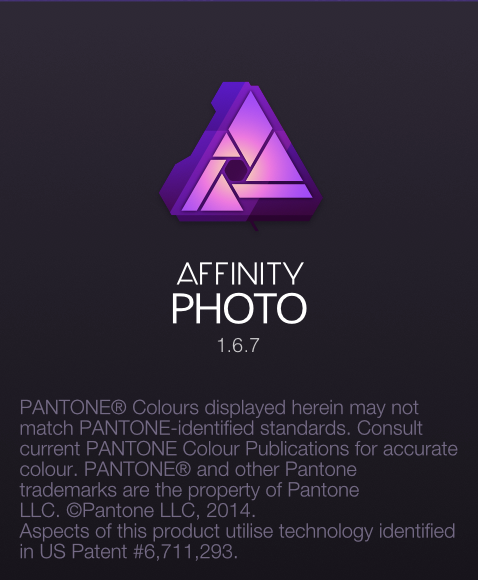 Serif decided that there would be no fix for this issue and in October 2018 I was advised to await the release of Affinity Photo 1.7 at that time and told that the update would be released "shortly" - here we are four months later still awaiting a fix. 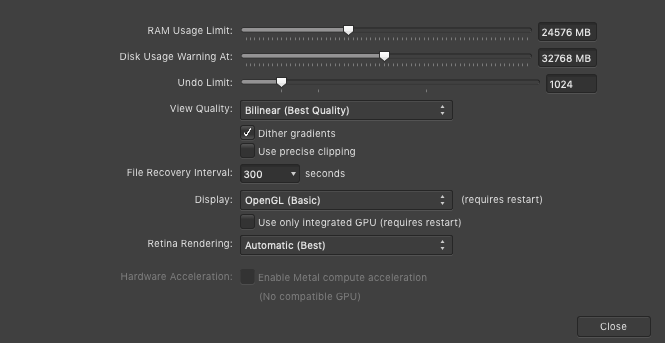 That said, there is a kind of workaround, you have to disable the Metal Accelerator in Preferences, in the screenshot you show the Performance pane, here you have to uncheck the Enable Metal compute acceleration. This will slow down rendering, however will allow APh to work. The other issue affected by the Mojave upgrade is Batch Processing - here when using the New Batch Batch Job process, you will have to uncheck the Parallel processing option (bottom left) and this will allow the Batch Job to proceed, albeit completing each image before moving on to the next which can cause long delays when processing large batches of images, but at least allows the app to work. APh also has a 1.7 Beta version available, however, it is recommended that this is not used for "critical" workflows, and in addition you will not be able to open v1.7 Beta native format files (.afphoto) in the 1.67 release, but I have been assured that once 1.7 is released, the full upgrade will be available and all the issues with MBP 2017 will be solved. I hope this helps you get up and running with Affinity Photo in the limited manner that many of us who (purchased a 2017 MBP, upgraded to Mojave and already had Affinity Photo installed) have had to put up with since upgrading to Mojave. It would appear that the small number of owners are not considered important enough to release a fix.